The Crocs Specialist II Vent, work shoes that let your feet breathe. 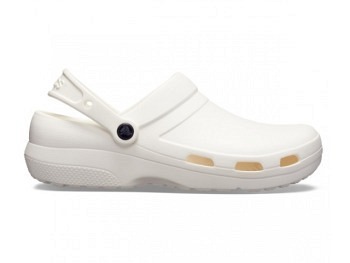 With an increased metatarsal area, this clog offers additional protection for the top of your foot. A croslite footbed, closed heel and raised edging around the portals make this the perfect shoe for work. You can personalise your Crocs Specialist with Jibbitz shoe charms on the straps. Combining comfort, personalisation and a wide colour selection makes Crocs Specialist one of the most unique work shoes available.